The number mobile devices in the class is an increasing challenge for students and teachers during the learning process. This means that it is more important than ever for all students to have a front row seat in the class whether they are using a Windows computer, Windows tablet, Mac or Chromebook, to be able to focus their attention and allow them to collaborate. 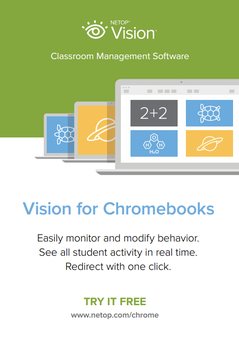 Netop Vision Classroom Management, for Windows, Mac and Chromebooks makes teachers more productive and improves students results. Corporate trainers also use Vision as their teaching platform. Give students a front row seat on their screen for detailed or graphical presentations.